Even though publishing in the anarchist space was down a little this month (it being the end of the summer and all) we (LBC) attended the Seattle bookfair, which means this Hammer will be heavy on PNW (Pacific North West) publications. This is exciting, of course, because these publications reflect the high level of anarchist activity in the area over the past year. This next month includes a trip to Victoria BC and Minneapolis. I hope this means that the next Hammer will reflect recent Canadian & Midwest publications and activities that haven’t made it to the interwebz. If your publication is more of the pdf/web variety send notice of it to me directly. There are already a couple dozen subscribers to the Hammer newsletter but feel free to add your name to their ranks. You can do that here. This is a journal that combines activist ethics with academic aesthetics. It uses this alloy to “construct sustainable alternatives to the racist, hetero-sexist system of liberal-capitalist nation-states”. Clearly the forged weapon isn’t particularly lethal but could probably spread a mean schmear or something. This issue is particularly strange for me as I am cited in several of the essays to such an extent that I feel like the missing contributor. Perhaps the editors didn’t know that I have an email address. The topic of the issue is called Anarch@Indigenism which is fine (albeit a little silly) but the subtitle basically makes me gag: “Working Across Difference for Post-Imperial Futures: Intersections Between Anarchism, Indigenism and Feminism.” I really wish that an attempt at a deep understanding of a topic, of any number of topics, wasn’t by those who are chasing, or have caught, careers in knowledge production. As long as I’m wishing I’ll add that I couldn’t easily understand these essays, which made it hard to access whatever interesting information was conveyed by the authors. This is an extensive report back on the context and events of the anarchist intervention in the anti-police struggles of early 2011 in Seattle, WA. If I were to criticize it, I would point out that its comprehensive and dry style is a nice counter-point to the flowery and semi-mythical style of other reports from the area, but isn’t half as compelling. It is, on the other hand, far more useful. This should be the template by which other towns strategize anarchist activity over the next few years. Plus, the fact-inistas will enjoy it greatly. This is a list of the prison-industrial-complex profiteers who are located in the PNW. This is an interesting project because it asks, without asking, for action against a list of targets without being explicit. It also evokes a kind of journalistic reporting that used to be done by the leftist press but has been long since abandoned. It is activist without prescription, informative without preaching, dangerous without the restraint of responsibility. My concern is that it will sit in a pile of paper, or in a directory of a hard drive, without ever finding the audience who could properly consider the fact that those who constrain us have names, addresses, and commutes. This is a fantastic and spirited anarcho-primitivist reclaiming of Conan the Barbarian. Not the Schwarzenegger version, although that would have been more awesome, but the original Howard version. It takes the original seriously and spends a great deal of time examining the definition of nature, violence, & social roles in Howard’s universe. It does err toward primitivist parody (for instance this quote is representative “Conan clearly has no love of or fear for the violent brutes who enforce civilized laws and oppress the poor and downtrodden”) but as we were informed of the author’s bias in the introduction it is forgivable. This is an older (2010) publication on the “hooded ones” of Greece, but this is the first time I have actually sat down and read this unassuming publication. Its stated intention is to move North Americans’ understanding of the Greek experience away from the mythological. For that purpose, this project is a total failure as the selection demonstrates fascinating and exciting aspects of the Greek experience which are in no way transmittable to the US. If the difference between Greece and the US is as simple as self-confidence, then hearing another set of stories about successful organizing, free spaces, and life long trusting radical relationships doesn’t exactly demonstrate this simple difference or point a way for us. On the other hand this zine is a best of the We are an image from the Future book and worth checking out in lieu of it.. Given the fact that I just returned from Europe, reading this personal zine/travel journal (visiting of many of the same places, including some of the same beds slept in) is very nice. The author lives a very different experience than I do, punkier, cut-and-pastier, and probably 15 years younger than I am. This journey spans Berlin, Milan, Spain, and much of the UK. This is a web instance of an Italian anarchist publication with a 40 year history and an open approach to anarchism. In their terms we want to discuss everything from God to the worm. This sounds great and this issue is indeed broad, albeit classical, in scope. It includes Proudhon, several articles remembering Colin Ward, an interesting article on anarcho-humanism, and much, much more. The closest publication in the US we have to this is Social Anarchism and similar to SA this is a publication of words and history rather than of the present and of the actions of anarchists today. To be specific, I asked an Italian comrade about this periodical and they nearly choked on the idea that one would take it seriously as the publication has been silent on the decades of anarchist struggle in their own country. Tides of Flame is the bi-weekly paper of anarchists-with-a-threatening-posture who have made themselves known in Seattle, WA. Reported on were the twenty-odd anarchists who were arrested in July, including several around the intrusion of police-with-shovel into a party at their group house and then a mass arrest at their solidarity demo the next day. Also an attack on a DOC office in West Seattle. Each issue has a well done piece on local anarchist history including an article on the George Jackson Brigade and the Seattle General Strike of 1919. Additionally there is new analysis/theory in the form of a rich article counterposing species being with the creative nothing and another on the Crisis. Other local articles, including one on a local cop and another on a local infrastructure project, round out these two issues. Awesome project that I have no idea how they accomplish every two weeks. This is the first book of a new anarchist fiction imprint and the first book (that I know of) written by Magpie (not counting his collection of interviews). It is a choose-your-own-adventure story which is a cute idea but isn’t nearly as compelling as I had hoped it would be. This is no fault of MK but a fault of the form, one that makes it difficult to hang together anything thicker than a children’s story. MK’s idea here is to put the reader into the role of protagonist and then push them along an adventure with a standard set of D&D/steampunk characters. The problem is that the conclusions are more or less arbitrary. There is no projectuality in this story and this means that it is an adventure for tweens and nothing more. But, anarchists need more of these too so… fair enough. For some time I have been lamenting the loss of the review, a format that is a great way to learn about projects, periodicals, and books that might interest a person. But it has largely died. The closest thing we had to an “anarchist review” was the brilliant column done by John Petrovato, but this was done infrequently at best and only ever reviewed books. There was also a great project from the UK called the Hobnail Review but it only lasted about a year and barely left the island. During my tenure at Anarchy: A Journal of Desire Armed I loved the task of saying a couple words about the new magazines and periodicals that came out between issues. Even when I was critical of the specifics of the product I always loved the process of talking about new projects. I love print (& to a much lesser extent the pdf seed of print) and always want to encourage us (by whom I mean anarchists: lovers of freedom, passion, and the future) to do more of it. To get it into the hands of more, and different, people and to nurture an attitude about print as one of the weapons we use to war against society. 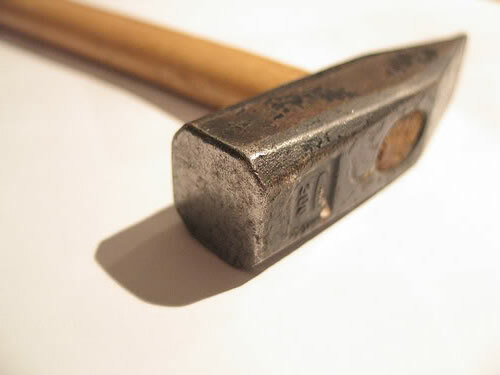 Therefore the Hammer is to be a counter-point to another project, The Anvil. While The Anvil uses the review essay to interrogate popular culture The Hammer will have a simpler task. It will provide mostly short reviews of current anarchist periodicals. It will focus less on critical engagement than on being informative (obviously I reserve the option though) and will focus on English (with only a cursory examination of other languages as I encounter them) publications. Each issue will reflect what is new in print, pdf, and other formats as time is available. If you would like to send me your new anarchist material please do so at PO Box 3549, Berkeley CA 94703. If you want to make sure I make a note of your publication drop me a line here. Along with this monthly newsletter there will be a print version of these reviews either along with The Anvil or in another form yet to be decided. Publication during this month’s edition of The Hammer doesn’t mean that the publication date was July, just that I received the publication this month (or earlier in this case). This will be sent out as an email from an automated email list. If you would like to subscribe to The Hammer visit this page http://www.angrylists.com/cgi-bin/mailman/listinfo/hammer. If you want to be unsubscribed (and were mailed this, probably due to a publication of yours being reviewed) the instructions should be on the bottom of this email. I am pleased as punch to see an anarchist periodical come from my hometown of Grand Rapids, MI, a reactionary midwest town that those who can, run from as fast as humanly possible. This is an author-less publication and tends towards rants and first person accounts of the trauma associated with living in this society. There is an interesting glimpse into the GR anarchist scene (which is a phrase I never thought I would utter) with the article Reflections on a Worker-run business and revolutionary potential. This bi-annual publication does a good job of collecting the writings of an international group of Anarcho-syndicalists. This issue has a special section on the Mid-East revolts of the spring of 2011 and an article on the simultaneous events of Wisconsin. Articles by van der Walt, Barclay, McKay, Hargis, and the indefatigable Bekken. This manual on sabotage is a new twist on an old idea. Mostly it feels like a rather thick reprint zine of old LWOD (Live Wild or Die) or pre-Judy Bari era Earth First! It is a fanzine in the traditional sense of having an obsession and then sharing every scrap of information (from the aforementioned publications) a fan could find about it. Poems about how great the earth is, striking graphics and cartoons, etc. Starting around page 100 are reprints of a few ALF recipes (wink, wink). This is followed by boilerplate security culture reprints and there you go. This revitalized UK magazine has considerable overlap with Freedom Press (layout and authors). Whereas Freedom is topical, Black Flag attempts analysis, interviews, and deeper reporting on the issues Freedom covers. This issue focuses on the student movement (there were a series of eventful student protests in London that were dominated by periods of uncontrollability and kettling) of the Spring. Interviews include Active Distribution and Atari Teenage Riot. Reviews include the Socialist Party, Mutual Aid (via an introduction), Derek Wall, and Dave Douglass’ biography. If you love the writing of Iain McKay you will love Black Flag. This is the new book by Ardent Press (standard disclaimer: I published this book). It is an anthology of egoist and individualist anarchism. The story it tells is of different groups who were inspired by the work of Max Stirner: dissident readers of US based Liberty , Italians who went to war with the existing order and French folks who took the lessons into a short lived illegalist practice of daily life. In addition there is a (too) short chapter on egoist readings of Nietzsche and short articles on egoist practice beyond robbing banks and attacking politicians. FTTP is an irrepressible publication from the New York area that bills itself as an insurrectionary magazine focused on reporting on struggles of the disaffected. It does this reporting to inspire its readers to do something about their own feelings of frustration and resentment. This issue continues the FTTP pattern of placing strong graphics with poignant text in the style of Adbusters or any number of post-Situationist magazines. The effect continues to be striking. This issue includes articles on the Arab Spring of revolt, Appalachian struggles against coal mining, repression, and a chronology of prisoner resistance. Freedom is looking healthier than I’ve seen it in a while. Good reporting, a silly cover image of a Crass crop circle (sighted near Stonehenge…), and a full color Wildcat comic, frame the issue. Contents include a criticism of News of the World and the latest Murdoch scandal, an obituary of Bob Miller, an analysis of recent prosecutions of UK anti-fascists due to a dustup in the London Underground. The highlight of this issue is the first part of a two part series on the role of Kropotkin on the modern ecological movement. This part focuses on Kropotkin’s theories around evolution and politics. This is an Iain McKay joint. A large, but by no means comprehensive, collection of Pierre-Joseph Proudhon’s work. The editor has also been writing quite a bit of supporting material, mostly on his blog at the ‘Anarchist Writers’. If you have any interest in PJ Proudhon, especially how his writings can be interpreted as being pre-Anarcho-Communist, you will get a fair reading of it with this collection. This is a brand new project from Max Cafard (who doesn’t do enough visible anarchist writing). At the heart of this new periodical, a surre(gion)al review, is an excellent review essay about the movie Avatar. It might be easy to dismiss this–as, on some level, everything that needs to be said about the monsterous movie has been said–but Cafard brings in great new information. Specifically he spends a great deal of time talking about the fairly recent advances in drone technology and how this relates to the future of warfare. The lesson of Avatar isn’t just about the incredible volume of money it generated but the ways in which it will and will not prefigure future warfare. This third book on the Greek Uprising (the non-AK book was called Everyone to the Streets) comes out of the Occupied London group who are Greek expats living in the UK. This book is a collection of essays by several dozens writers who provide a less activist, more learned context to the environment around Athens prior to the 2008 uprising and since the uprising into the current economic crisis. Some of the highlights include the analysis by TPTG, Christos Boukalas, and Antonis and Dimitri (who are part of the editing group and who toured the US in the spring of 2011). This is new biweekly periodical from Seattle is incredibly ambitious. Along with the real stories of the activities of the comrades in the PNW are original analysis and histories. Just in the first two issues, which both appeared before 26 people were arrested in late July, are writing about the George Jackson Brigade, recent actions in the area, terrorism, rebellion in walla walla, an artist named Zeb, and much more. If you are in the area you should help this project out. This is an issue of the Milwaukee zine that has appeared sporadically over the past few years. From a rough start this issue stands tall as an object lesson in how theory is related to, and improved by, practice. This issue reflects the participation of the authors in the events that surrounded the Wisconsin occupation of the Capital building in response to Governor Walker’s attack on the rights of the Unions in negotiations with the state. Included are accounts of the occupation, of actions (not non-violent) taken in the state, interviews with the authors, and communiques issued at the time. This is a modern zine with well thought out positions on a variety of topics. One, a lengthy article critical of anarchist spaces, makes arguments against localism, for pre-figuration, and touches on both Holloway and Delueze (“our appropriated spaces can become nodes in a web of power”) without sounding too high falutin’. Other articles include one on Libya, an interview with Mutiny, a review of the local anarchist summer school (! ), Athens, and liberalism (anti). This is a strong first showing for this project of not-ideological anarchism.